So, this is mainly going to be for the ladies to post pictures, since guys can’t take photos in the brothel, but if you guys have any pictures posted on either the forum, blog, or Twitter that may fit, please join in! This is exactly as it sounds, a feed for us all to post our favorite photos of a great memory that we shared at the Brothel. I’ll start it off with tonights events! 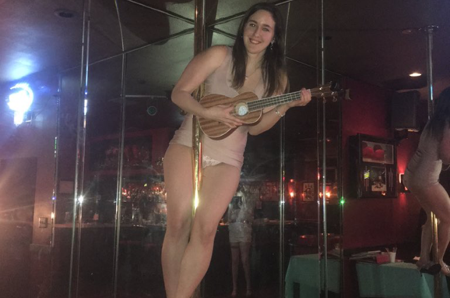 Our beautiful girl Terra on the pool in the bar with a ukulele, and may I jut say, girl I got n instrument you can finger any time!!!! Hugs, loves, and great moments!!!!! This topic was modified 3 years ago by Angel Parr. Good idea for a thread, Angel. Thanks, hopefully it will get lots of fun hits!